Разстояние до летището 52,4 км. Имате въпрос към Mbah Mek Trawangan Homestay? При посещение в Ломбок, в Mbah Mek Trawangan Homestay ще се почувствате като у дома си, защото предлага квалитетно настаняване и отлично обслужване. Хотелът не е далеч от центъра на града - намира се само на 0.5 km от него, а до летището се стига за около 180 минути. С удобното си местоположение хотелът предлага лесен достъп до всички градски забележителности, които задължително трябва да се видят. Възползвайте се от богатството на ненадминатите услуги и удобства в Ломбок. Този хотел предлага множество удобства, за да задоволи и най-изискания вкус. Дизайнът на хотела е съобразен с най-високите изисквания за удобство и комфорт, осигурявани от съоръжения достъпни в някои стаи като телевизор с плосък екран, безжичен интернет достъп (безплатен), климатик, бюро, балкон/тераса. Освен това в хотела можете да се възползвате от множество предложения за приятно прекарване на свободното време. Mbah Mek Trawangan Homestay е най-подходящото място за Вас, ако търсите качествен хотел в Ломбок. Very nice Homestay. Family very friendly. Nice relaxing environment. Easy walking distance to bars and restaurants but far away enough you can’t hear it. Breakfast was different everyday and served on your own terrace. Would stay again! We stayed here for 1 night before leaving Gili Trawangan. The owner is really nice. When we just arrived at this place, he asked us what time we want to have our breakfast the next day. He always tried to help us when we needed his help. One problem was that we could hear the noise from outside. Other than this, everything was okay! Breakfast was very nice :) There are everything you need in the room. We left Gili T for a few reasons which had nothing to do with the homestay so I'll address these first for anyone thinking about visiting. If you're after the beautiful beaches you see in the photos, don't bother. They're all incredibly photoshopped, very corally and rough sand and barely anywhere to perch for the day when you do want to go to the beach. Nothing like what you see online. Another is the extortionate price of food (and not worth it in our opinion). We always eat from the cheap eats suggestions on TripAdvisor and trust me, it was far from cheap anywhere. Onto the homestay. We booked this based on the incredible reviews it got. Honestly, I was so disappointed! The owner, who was supposed to be the most helpful guy barely said two words during our stay. We were greeted with 'Amy, Number 4' and that is all that was said until we left (two days early). The room was ridden with frogs, mosquitoes and i even found a cockroch one night. The air conditioning was terrible and the shower lacked any type of power, even by South East Asia standards. Overall, really disappointed and definitely wouldn't stay again. Great place to enjoy your holiday. The owner Mr. Mbah is a very nice old person. All I can say, DON'T JUDGE THE BY ITS COVER. Clean, very friendly owners with fast wifi and good aircon. Breakfast was filling and different every day. Good location a 5-10 min walk from the port. You will get woken up by the chickens each morning but we thoroughly recommended this homestay. We had a wonderful time here. Our room was cleaned every other day which was plenty. Breakfast was always prompt and something delicious and different each day. They were friendly and helpful throughout our stay (we extended by another three days). The location was out the way enough not to be noisy but close to shops, beach, restaurants and bars, perfect for us. 5/10min walk to the beach. Really cool homestay with VERY clean facilities. The breakfast every morning is very good and different everyday. 10 minute walk from the main strip so I think it'll be a good idea to rent a bike during your stay or simply walk. If I come back to Gili I will definitely stay here! Excellent budget accommodation. Owner and staff very friendly. Very clean. Lovely breakfast on our balcony. Hot water in a flask and coffee on request all day. Hot and cold fresh water shower. Very good AC. 8 to 10 minute walk from harbour, found it easy with maps.me app. TV with satellite channels. 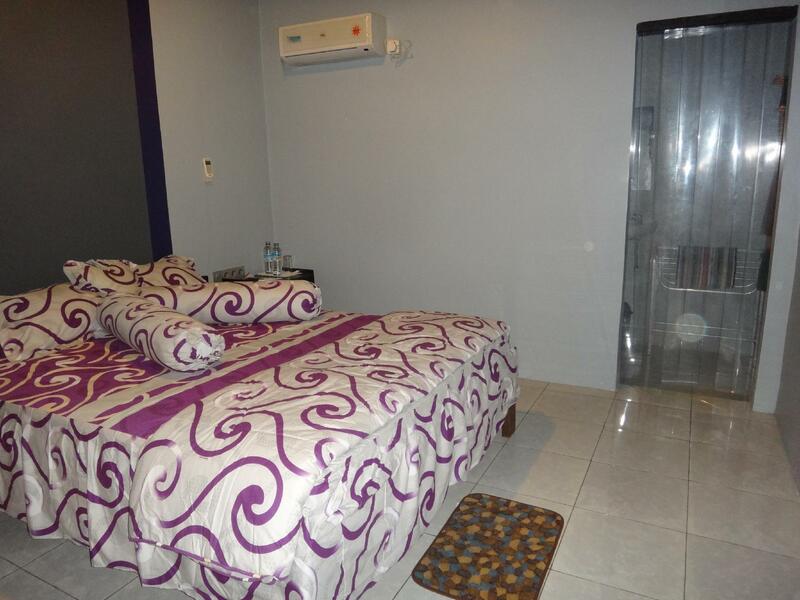 Really clean room with comfortable bed and shower. Owner/staff is extremely friendly and helpful. Location is just a small walk from the main road. Not for the traveller who has high resort like expectations, but perfect if you just want a nice place to sleep, shower and eat breakfast. Would recommend to everyone. Mbah Mek is furthermore a really friendly man who wants nothing but to help his guest. His wife makes the best breakfasts everyday of your stay. You are staying in an Indonesian neighbourhood though and not some secluded resort, if you want the latter and think loose running chickens, dirt roads et cetera are filthy this is not the place for you. Great and friendly owners, breakfast was huge... Lots of coffee, CHEAP CHEAP CHEAP, rooms were big, toilets were "older" with no door, but for that price its great.. Only stayed 1 night, but if ure traveling on a budget its for you. Great breakfast, great service, great room. Our stay here was great. It's a little far from then beach but you get the real feel of gili local life here. The room was great, AC worked well great English TV channels different tasty breakfast every morning with new water bottles and coffee and fruit. The owners are ahh a nice couple and very kind and helpful. For the price it is fantastic! Can't complain. The power went out once while we were here but that is normal for the island and the owners gave us lights and were very nice making sure we were ok. Highly reccomend this place. Lovely little home stay, rooms are clean and great value for money for Gili considering they are modern, with air con and a TV. The owner wasn't sure what to cook for breakfast when I advised I followed a vegan diet (strict vegetarian) he obviously went away and thought about it and served me two delicious vegan friendly meals both mornings. I would return here great place to stay.